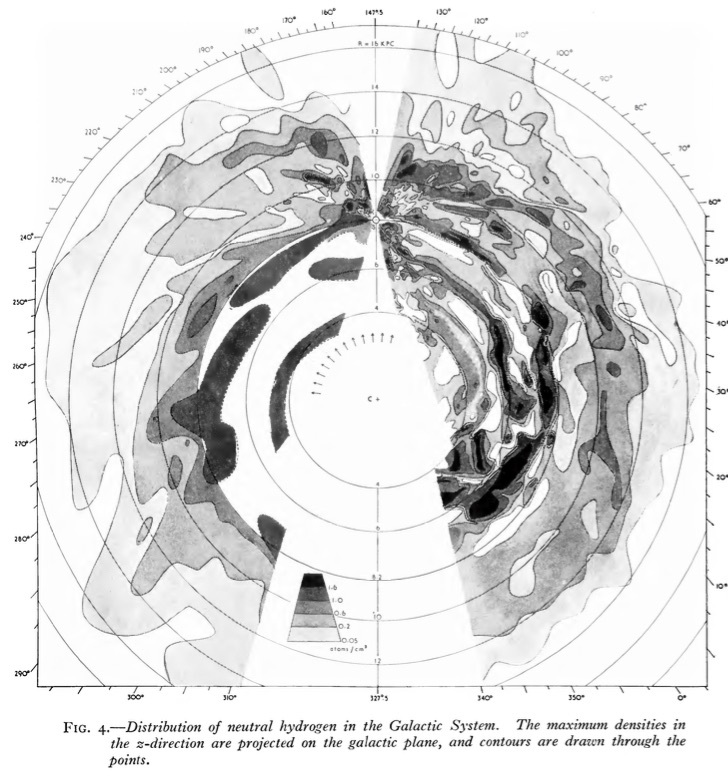 The article includes the image shown below, which is a 21 cm radio map of the Milky Way galaxy. (for more on the transparency of dust at 21 cm see this excellent answer to How was the galactic plane established? You can also read more about Oort's work during this time in this 1976 AIP Oral History Interview interview. I'm guessing that the center of the plot is the galactic center and the point at 8 kpc above it is the Earth. What is the reason for the two blank wedges, projecting downward and upward from the Earth? Are they geometrical, blind spots from the few early radio telescopes in the 1950's perhaps, or do they reflect real phenomenon in the galaxy? TLDR: these wedges are bits where things are moving around the centre of the galaxy at about the same speed as us, so we can't understand what is there. Observations in the decimetre continuum can only give the integrated radiation over the line of sight. The 21-cm line gives discrimination in distance. But although the 21-cm observations give discrimination in distance they cannot by themselves provide actual distances. The distance distribution in a given direction can only be inferred from radial velocities. 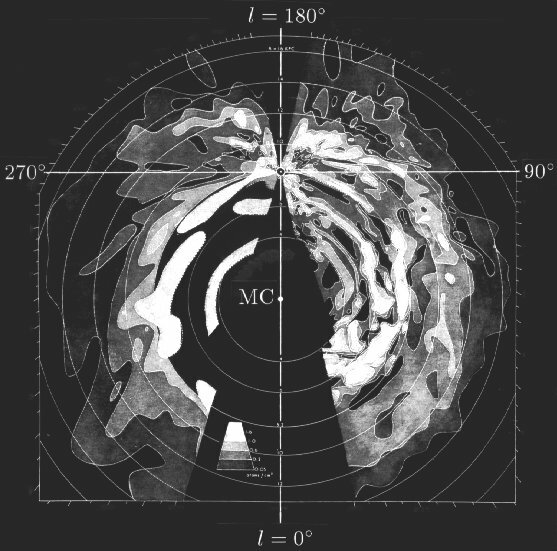 For this we have to suppose that in each part of the Galactic System the average motion of the gas coincides with the circular velocity at the corresponding distance from the centre. The map is given by combining several observations at different wavelengths - the 'decimetre' gives the total amount of stuff along the line of sight (because it isn't absorbed much along the way), the 21-cm line gives a measure of distance (because it is absorbed so predictably wakened by the amount of stuff it has passed through), and then to we have to assume a model of Keplerian rotation as a guess at how things are moving around the centre of the galaxy. Combining these three things allows you to map out the material even though you are seeing different bits stacked together along your line of sight. This doesn't work in the blank wedges because the speed of rotation is too similar to ours, so we can't use the rotation velocity to disentangle distances. Not the answer you're looking for? Browse other questions tagged observational-astronomy milky-way radio-astronomy or ask your own question. Milky Way stellar number density : is the stated equation in this paper incorrect? Can Milky Way be seen in South hemisphere only?